IT had already been a season to remember for in-form Ryedale trainer Tim Easterby and jockey David Allan before Wells Farhh Go got up on the line to win York’s Acomb Stakes and maintain his unbeaten record. Royal Ascot success with Snoano was followed by Mattmu winning Ripon’s Great St Wilfrid Stakes last Saturday before this most existing of two-year-old prospects prevailed in a thriller. 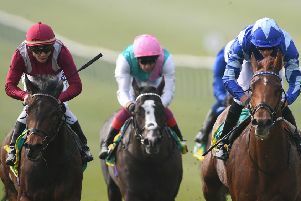 It looked like Frankie Dettori would prevail on James Garfield – but Allan’s mount needed every yard of the seven furlong Group Three race and the photo-finish result was greeted by a thunderous cheer to rival the earlier storm that saw 15mm of rain fall in 90 minutes and turn quick ground into a stern test. Easterby, whose legendary father Peter is the only trainer to record at least 1,000 winners under both codes of racing, has never been a man to make outlandish predictions. Yet not only is it significant that Wells Farhh Go, also victorious at York last month, holds Group One entries – the Easterby family have never forked out these fees for nothing – but he also compared this exciting prospect to his 2002 St Leger winner Bollin Eric. Time will tell, said the Great Habton handler who thought it might have been a mistake to run the horse, sired by the former Champion Stakes winner Farhh, over a shorter than ideal trip. “I thought he hadn’t quite got there and that I should have run him over a mile,” said a smiling Easterby in the winner’s enclosure that has become synonymous with his redoubtable family through the years. “He’s in the Royal Lodge and the Group One race at Chantilly (Prix Jean-Luc Lagardere). Whether we run him or not, I’m not sure. “He’s a big horse and needs a bit of time. “I think he might be another Bollin Eric, he’s not far off. He’s just a very good horse in the making. One day he will be a proper horse. He’s had a hard race there and I wouldn’t be rushing to run him quickly. “I had a lot of offers for him since his last run and I resisted. I bought him at Tatts Sales as a yearling. He was just a big nice horse. “He showed me a nice bit of speed early on so we waited a bit with him and gave him a chance. York’s flagship meeting began with Yorkshire success when Paul Midgley’s Desert Law won the Symphony Group Handicap just four days after striking at Doncaster. The outsider tracked the early pace cut out by the fast-starting Thesme, before forging on under Luke Morris deep inside the final furlong. Meanwhile, John Gosden’s Cracksman – placed in both the Epsom and Irish Derbies – turned the Great Voltigeur Stakes into a procession under Frankie Dettori. Patience is clearly paying off with this son of Frankel whom, form and fitness permitting, will be a formidable force in next year’s middle distance Group One races. And Magic Circle, victorious in the Fine Equity Handicap for jockey Harry Bentley, could attempt to double up in Saturday’s Ebor – the historic handicap. Final declarations have to be made by 10am today and trainer Ralph Beckett is open to the possibility, though it depends on how many higher-rated horses are withdrawn. Beckett said: “He might get in, he might not, but he obviously loves it here. Karl Burke hopes Unfortunately can develop into a serious contender for next year’s Commonwealth Cup at Royal Ascot following his first top-level success in France on Sunday. Although an outing in the Juddmonte Middle Park is next on the agenda after leading home stablemate Havana Grey in the Prix Morny, the Leyburn trainer already has half an eye on the six-furlong Group One prize at the Royal meeting that he won last year with Quiet Reflection. Burke said: “Unfortunately will head to the Middle Park now, but I can see him being a serious contender for the Commonwealth Cup. Havana Grey could now drop back to five furlongs, with Burke considering a tilt at next month’s Flying Childers Stakes at Doncaster ahead of a possible return to France for the Prix de l’Abbaye at Chantilly in October.